The Halloween Parade that Lou Reed sings about on his 1989 New York disc had been left for dead. Neither 9/11 nor Hurricane Irene in 2011 could stop the parade. Huricane Sandy in 2012 did bring about its death...or do we speak of the parade's death prematurely? Now risen from the dead through a crowd funding effort, the Greenwich Village mainstay has come back to life. 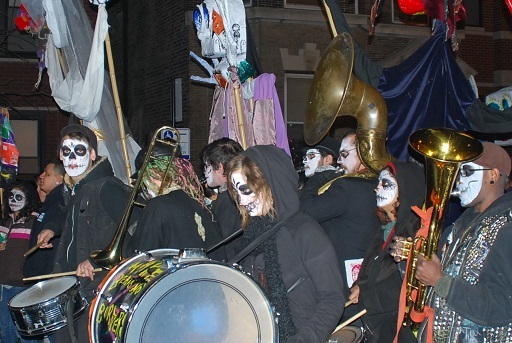 But is it the same Halloween Parade that Lou Reed sang about? Today, the Halloween Parade makes its way up New York's 6th Avenue with crowds numbering in the millions lining the route and joining in at will. It is the largest Halloween event in the United States with more than 50 000 participants and an estimated 100 million watching at home on TV or streaming worldwide. Back in 1974, the parade began on West Street, winding its way through Greenwich Village before it concluded in nearby Washington Square. The brainchild of artist/puppeteer/mask-maker Ralph Lee, the parade quickly outgrew its humble if flamboyant origins. By 1985 the Halloween Parade had become a colossal spectacle though its founder would leave the helm following the 1985 edition. In Halloween Parade, written at the height of the AIDS epidemic that had ravaged the gay community in Greenwich Village, Reed laments the loss of many of the faces and people who had made Greenwich Village a vibrant community. A community that began to stand tall with the Stonewall Riots of 1969. Halloween Parade is the counterpoint or the sad conclusion to Reed's Walk on the Wild Side from 1972. The song is also a reminder that Reed was a powerful lyricist with a social conscience. Halloween Parade like many of Lou Reed's better songs translates sublimely as poetry. The New York album was a sketch of Lou Reed's hometown in the late 1980s. Rolling Stone in its review of New York hailed it as, "fierce, poetic journalism." New York also reunited Reed with former Velvet Underground drummer Maureen Tucker who played percussion on two tracks. At the time, Reed insisted that the album be listened to in its entirety as if one was reading a book. New York was considered by critics to be his best effort in years and made its way to a lot of critics top ten lists for 1989. The album also received nods as being one of the best albums of the 1980s. Following Lou Reed's passing on October 27, 2013 critics and fans alike returned to his music. Spotify saw a 3000 percent increase for streams of Lou Reed's solo and Velvet Underground music. In the United Kingdom The Guardian lists Halloween Parade as one of the six best songs in Reed's oeuvre. There's a downtown fairy singing out, "Proud Mary"
There's a girl from Soho with a t-shirt saying, "I Blow"
Rest in Peace Lou Reed. March 2, 1942 – October 27, 2013.